Note: Updated data for 2010 is available here. 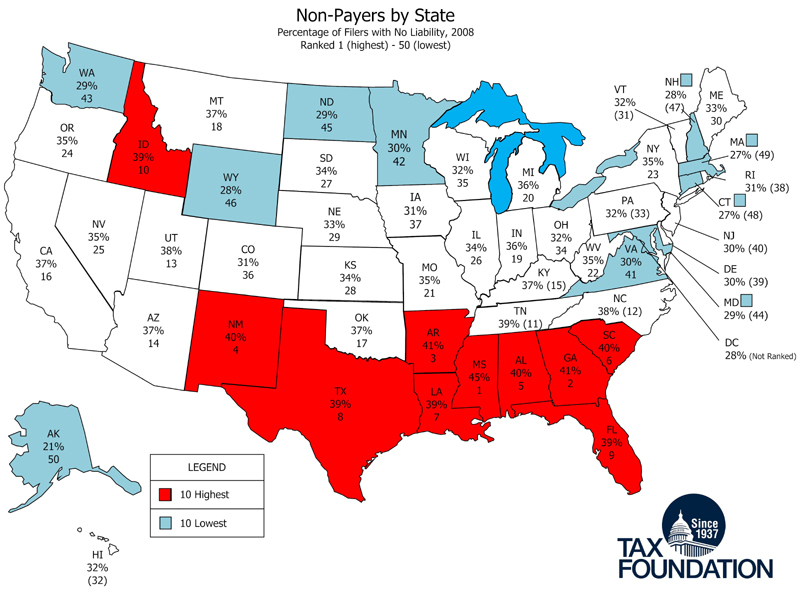 Southern States Have Highest Percentages of "Nonpayers"
One of the most reported topics during the latest tax filing season was the record number of Americans who filed an income tax return but had no income tax liability after taking their credits and deductions. New data from the IRS allow us to calculate the number of nonpayers in each state who filed a tax return. Here we compare the percentage of nonpayers in each state, both the absolute number of returns and the percentage of returns filed in each state. Generally speaking, the most populated states have the most nonpayers. More than 6 million tax-filing Californians paid nothing to Uncle Sam for the 2008 tax year. That was 37 percent of the 16.4 million tax filers in California. The map on page 1 and the table below show the percentage of tax filers in each state who have no income tax liability as well as the state's rank among the other 50 states. Nine of the ten states with the largest percentage of nonpayers are in the South and Southwest. In Mississippi, 45 percent of federal tax returns remit nothing or receive money with their federal tax returns; that is the highest percentage nationally. Georgia is next at 41 percent, followed by Arkansas at 41 percent, and Alabama, South Carolina, and New Mexico at 40 percent. All of the top 10 ranking states have among the lowest median family incomes in the country. Of this group, Georgia has the highest median family income at $60,268. Mississippi has the lowest at $46,668. By contrast, the states with the lowest percentage of nonpayers are not as geographically concentrated. What they tend to have in common is higher incomes. Half of the 10 with the lowest percentage of nonpayers are in the Northeast and half are in the West and Northern Plains states. Alaska has the lowest percentage of nonpayers, 21 percent of filers. Massachusetts has the second lowest at 27 percent, followed by Connecticut (27 percent), New Hampshire (28 percent), and Wyoming (28 percent) to round out the bottom five. 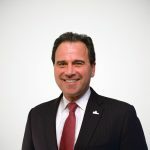 1 Scott A. Hodge, "Record Numbers of People Paying No Income Tax; Over 50 Million 'Nonpayers' Include Families Making over $50,000," Tax Foundation Fiscal Fact, No. 214, March 10, 2010.